Rates, fees and other information are effective as of February 1, 2019. Subject to change. ◊ The introductory 0.99% interest rate applies only to cash advances (including balance transfers, Scotia® Credit Card Cheques and cash-like transactions) (collectively "Cash Advances") subject to the conditions below (the "Offer"). This rate applies when the new Scotiabank credit card account ("Account") is opened by June 30, 2019 and will continue for 6 months from date of Account opening (the "Promotional Period"). This Offer cannot be used to transfer a balance from another Scotiabank Account, or to make a payment or deposit to another Scotiabank account. After the Promotional Period, the 0.99% interest rate on any promotional balance transfers (including any that remain unpaid after the Promotional Period ends) will increase to the preferred interest rate on Cash Advances (currently 12.99%). If you don't pay the minimum payment on your Account by the payment due date on your statement, two times in any consecutive 12-month period, you will lose the benefit of this promotional rate Offer and the interest rates that apply on any unpaid balance will increase to the standard annual interest rates that apply to your Account (currently 25.99% on purchases and 28.99% on Cash Advances). In general, if you make a payment that exceeds the minimum payment on your statement, we will apply your payment on a proportionate basis among each group of billed charges on your Account. We group charges based on the interest rate that applies to the group of charges. Your payment cannot be applied to the balance(s) of your choice. See your credit card agreement for more information about how we apply payments to your Account. Looking to pay off some credit card debt? There's no sense wasting hard earned money on interest payments (which often prevent you from making a serious dent in your principal!) when you could be paying as little as 1.99% on balance transfers. 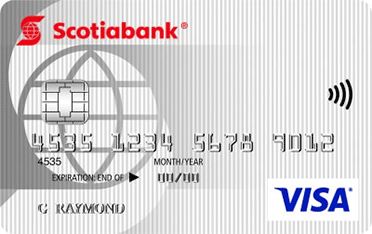 Many credit card consumers don't fully understand the concept of a balance transfer, but these credit cards can be excellent tools in the quest to be debt-free: transfer an existing balance from a higher interest rate credit card to the Scotiabank Value® VISA card and pay only 1.99% in interest for the first six months. On top of that, the ongoing interest rate for new purchases is only 11.99%, much lower than the average 19.99%. Plus, pay no hidden balance transfer fees! All with a low annual fee of $29. After your first six months are up and the introductory interest rate ends, you'll pay a low rate of 11.99%. To put this into perspective: if you're carrying a balance of $1,500 on another credit card with a 19.99% interest rate, you'll save $139.65 in the first six months alone by switching to the Scotiabank Value® VISA card. All interest totals include limited time interest rates, credits, bonuses and annual fees.